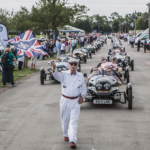 What a spectacular weekend the Morgan Motor Company staged for Run for the Hills 2017. British manufacturing at it’s best. Morgan invited local artists, designers and speciality food producers there to help celebrate all that is great about British craftsmanship. Of course the Silk Bureau was delighted to be able to contribute towards the setting of the Gala Dinner and the Stage when we were asked to print the backdrops for them. 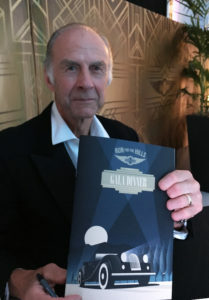 The explorer Sir Ranulph Fiennes was there to give a captivating talk on his adventures. We couldn’t help but snap a photo of him in front of one of the 26, 10ft banners that helped to set the scene. 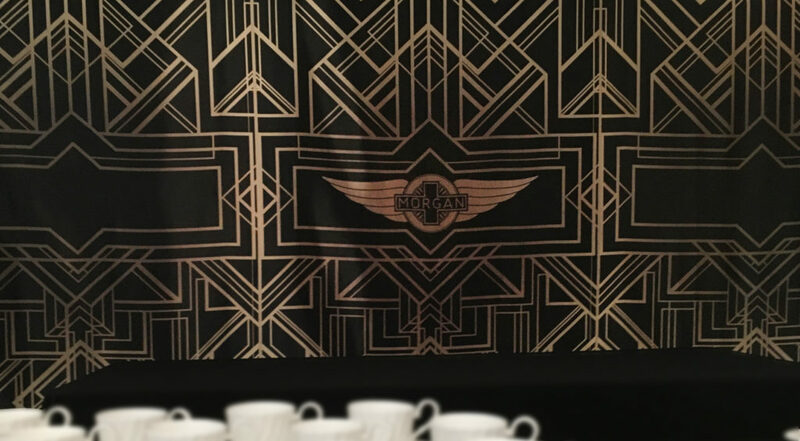 To reflect the Art Deco theme for the Gala Dinner, Morgan placed their iconic ‘wings’ in the centre of a geometric lattice work design. Printing, both a Gold and Black version on our Poly Dimout helped to set the stage for glamour and glitz. Sourced 1920’s free standing lights brought out the shine on these opulent banners. 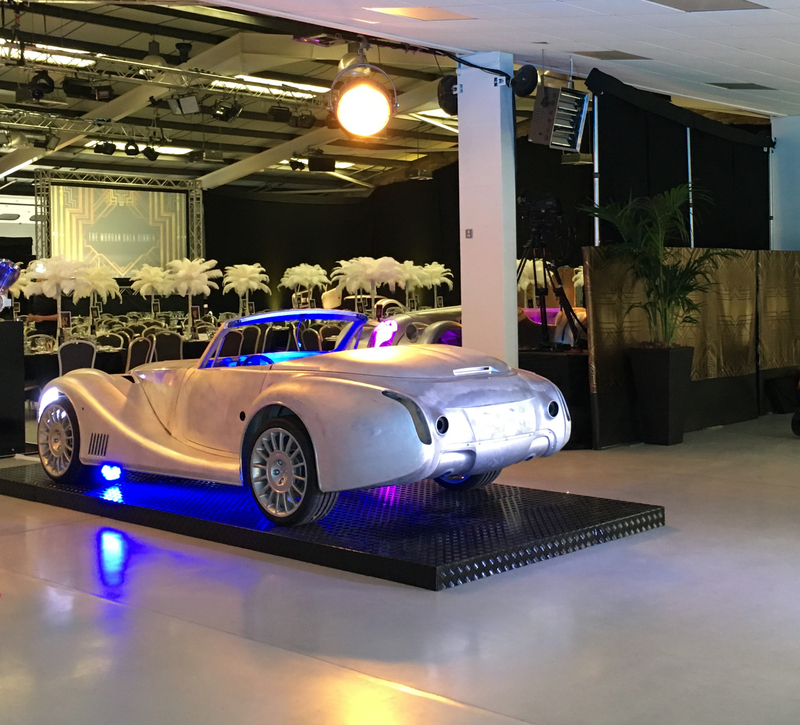 An extraordinary visual display met the guests as they arrived for the Gala dinner. 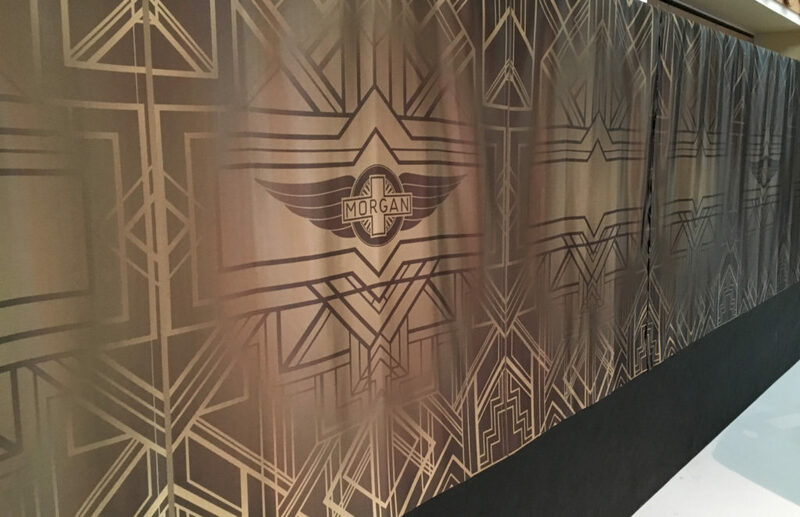 Plinths of Morgan cars and parts were presented as sculptural pieces against the backdrop of shimmering printed fabric. Simple, elegant and sophisticated; what better way to reflect this romantic era. Preparing this Order we used our sublimation printer that uses a heat transfer method of infusing colour to fabric. The metallic aspect of the fabric reflected the cars body work ideally. The results were outstanding.